We want to invite you to visit us while we are on book tour. To find dates and cities please visit our Events page. Hope to meet you! Click here to watch our video and join our #PizzaPartyin5! My favorite pizza was a Mediterranean Chicken Pizza I had at an Italian restaurant. I’ve been trying to replicate it, but with minimal success. The combination of the pesto and chicken cannot be beat. I am so glad I found this site. Last fall, I made a decision to not buy bread anymore. I’ve been dragging on it a little, and this site gave me a nice kick in the pants! My favorite pizza is spinach and chicken pizza. I made Wednesday. Mmmm… I used spinach and Alfredo sauce, then topped it with chicken, mushrooms, black olives, onion, and an Italian cheese blend. I love it with sauce not too sweet, artichoke hearts and prosciutto. Oh yeah, fresh basil, too. I tend to like the crust a bit on the thicker side, but those crispy edges are pretty yummy! My favorite pizza is one that I’ve not often found here in America, but something I always found in Europe. Quattro Formaggi (Four Cheese). Four yummy cheeses on a delicious pizza crust. It can’t be beat! I love your bread recipes and have all of your books. I want to try your Brioche and Challah breads, but as a vegan, I don’t use eggs. What I can use as an egg substitute in these recipes? Oooh, this looks great. And possibly doable for a novice like me. My favorite pizza right now comes from an Italian restaurant in NY that’s half calzone, filled with ricotta and soppressata, and the other half is topped with smoked buffalo mozzarella, cherry tomatoes, and basil. My favorite is basic cheese pizza. Once it is assembled I can then add almost any ingredient on hand including left overs to make the pizza of the day. Think of all the possibilites!! My favorite pizza is chicken, spinach, and artichoke hearts. Hello, Can you tell me if Naan is the same as indian fry bread? Excited for this book! My favorite pizza changes, but I love anything with lots of garlic and fresh tomato! My favorite pizza includes mushrooms, green olives, and crushed red pepper! Love the new book so much! I waited months for my pre-ordered copy to come in. Thank you to you both for the tremendous technique that continues to surprise and amaze me and the delicious foolproof recipes. Tonight it’s the American-style crust with roasted vegis, spinach, and your tomato sauce recipe with garlic. Thanks and Congrats! I’ve been making homemade pizzas for 30 years…but I really never found the perfect pizza until ABin5 was published. I didn’t think Pizza and Flatbreads in 5 would teach me anything I hadn’t already tried….Oh, was I wrong…I happen to have easy access to 00 flour and tonight made a batch of the master recipe. Heavenly! !…I am still a big fan of pre baking my crust on parchment paper for about 3 minutes…remove from the oven and add toppings..then finish the baking…So easy and no risk of fold over pizzas. Jeff and Zoe feel like next door neighbors….only wish they were! Do you use less 00 flour in the recipe due to its finer texture??? In general, I think you need a little more– it has lower protein. Which of our books do you have, I can direct you (depending on which)? Nice to learn that someone else is using Italian 00 “Pizza” flour. I use Antimo Caputo 00 flour that comes in 2 1/2 lb bags. I am going to convert the basic pizza dough recipe so I have to do is dump the entire bag of flour into the liquid. Can’t wait to try this. We love all kinds of pizza and make it often from your master recipe in the first book. Lately we’ve been fond of Chicken, Bacon, Ranch pizza. We use ranch for the sauce, drain some Rotelle tomates throw on the chicken, bacon and cheese and it’s done in a snap. Not sure if the contest has closed yet, but just in case…loveloveLOVE the Margherita Pizza but my ultimate, absolute favorite pizza of ever is a thin,crispy olive oil crust pizza with a fresh tomato sauce, just a whisper of good mozzarella and kalamata olives with artichoke hearts–HEAVEN on a plate! Thanks for everything–I have always been a busy mom and a yeast-phobic–now I’ve been baking fresh bread, bagels, rolls and pizza for my ever-so-grateful family for months! Our favorite pizza is a variation of buffalo wings. I use the dough from ABin5, top with shredded, grilled chicken breast doused with buffalo wing sauce, top with mozarella and bake. After slicing, we sprinkle on Blue Cheese dressing and serve with celery sticks. So good. One of the most amazing pizzas I have ever had was a wood-fired pizza that had an extra virgin olive oil base (instead of a red sauce). For toppings, it had slices of tomatoes, cheese (forgot which kind), prosciutto, and the best part was very large leaves of spicy arugula. Something about the blend of the flavors and the contrast of the arugula was just wonderful! I’m embarrassed to admit that when I order out, I love ham & pineapple toppings. But when I make it at home, I love pizza margherita made with fresh ingredients. Can’t wait to try this recipe and check out the new book. Favorite pizza is a crisp flatbread crust with thinly sliced home-grown ripe tomatoes and lots of fresh herbs. My favorite is a margherita made with slices of heirloom tomatoes rather than sauce. Perfection only comes in August when the tomatoes are at their peak! We love to make a traditional pizza, but use a pumpkin-based dough. It is SO delicious, and healthy for you, too. Oh I haven’t the new book yet. I make the Olive Oil Dough every week. Last Christmas for Open House I made 40 mini pizzas and there were only three left Roll the dough out to 4″ circles and top with Salsa, cheese, mushrooms and black olives. Or let your guest make their own. They are great. When they pass over ham for pizza you know you have a winner. Now to try and make English Muffins for Eggs Benedict. In all my years have never met a pizza I didn’t love…favorite is hard to pick…probably the one right in front of me at the time. Have been baking many years, but your recipes are the best. Many thanks. OK..favorite must be thin crust margherita. One of my most favorite pizzas is the wild mushroom thin crust from California Pizza Kitchen. Its so earthy with lots of garlic. No need to worry about vampires after eating that one! I love the margherita pizza but my husband prefers pepperoni and bacon! My favorite pizza is the Chef’s Choice from Eugene, Oregon’s Pizza Research Institute. It’s always loaded with an astounding array of stuff: asparagus, fruit, potatoes, broccoli, onions, sometimes even corn on the cob! My favorite pizza is one I just experienced while in Italy. It was thinly sliced zucchini brushed with olive oil and sprinkled salt. The crust was thin and crispy. I can’t wait to use this dough recipe to replicate this delicious pizza. I love love love your method and ALWAYS (ok so long as it’s not too hot to use the oven) have something in my fridge from your books. Boule tonight. My favorite pizza is either a potato pizza or a margherita adulterated with some proscuitto. Yum. Michelle: Not currently scheduled back to Chicago, so sorry! Our favorite make-at-home pizza would have to be either greek (kalamata olives, artichoke hearts, pepperoncini, and capers with feta cheese) or BBQ Hawaaian (BBQ sauce, pineapple, ham, and real bacon bits). I’ve always been a Hawaiian fan, but recently I started getting into margherita pizza. Can’t wait to try this! A good fresh Margherita Pizza is amazing and hard to beat, but I’ve actually driven an hour each way to get a wood fired meatball pizza. Yum! Broccoli and mushrooms on soy or rice cheese and my favorite sauce: Bove’s marinara. Jeff & Zoe, Thank you for another wonderful book! I want to make the Italian torta. Do you have a preference as to the best dough to use? I am going to make a chicago style pizza tonight with cornmeal dough but wondered what preferences you both have on the torta. I am preparing an Italian vegetarian dinner for 8 in early December and am thinking about making the torta as part of the menu. I just picked up a copy of the new pizza/flatbread book. I like to bake with whole grains, so my question is: how well would whole wheat pastry flour work as a substitute for Italian “00” flour? Would that allow me to get a more tender whole wheat crust? Hi Jeff! Love your concept of breads in 5 mins, you make having home-baked bread seem so easy and effortless! I tried your olive oil pizza dough which has 6 1/2 cups flour, 2 3/4 cup water and 1/4 cup olive oil. Had a couple of queries. What should the dough look like at the end of the rise periods when you mix the dough? How much should it rise before it flattens out? I first baked the rolled dough for 10 minutes at 250 C (highest in my oven) and the dough puffed so high!!! Is this OK? Is pizza dough always to be baked with the toppings and sauce and not the rolled dough alone first? Would love to try this again..Sorry about the HUGE comment! Grilled pizza is a favorite in our house. Almost any dough can be taken out to the grill, cooked on one side, flipped and filled with pizza makings. Sit on the deck with your favorite beverage and enjoy the yummy smells filling the air. Fifteen minutes later…Enjoy! Help! I love the flavor of your dough but no matter how much cornmeal I put on my pizza wheel, it sticks and I end up with a smoking disaster in my oven. 🙁 Any tips? You can bake the breads and pizza on parchment paper if your dough is sticking too much. 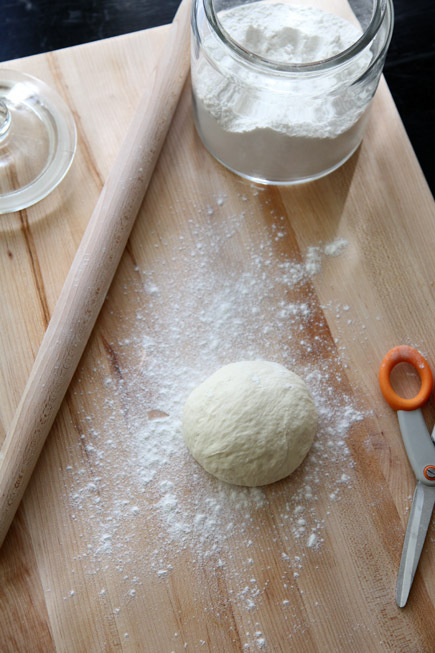 Sounds like you may need to use more flour when shaping your pizza. Also, make sure that you have all your toppings ready to go so the pizza isn’t on the pizza peel for very long. Why is this olive oil pizza dough recipe different from the one in my book? Is this an updated one? Jody: We publish all different versions in the various venues we work in and they’re all good– it’s just a matter of preference. The publisher generally doens’t want us using the exact same material from the books here on the site, for reasons of copyright law. I’ve been making your pizza dough for quite some time, but it never comes out as fine, smooth and stretchy as in your videos. I’m using a kitchen scale, converting (to grams and ml/cc) all given amounts using the measurements table provided in the last book. would you please help “translate” the basic olive oil flatbread dough in this post to grams? I like making pizzas in our BGE. I will try your recipe this week. Thank you! Funny story – I was in a touring dance band in the 80’s, and we tried to eat well… which is not easy on the road. Our rule – we only ate at restaurants recommended by locals. This is especially true for PIZZA! Anyone can hang a sign, quality be damned. We had the same philosophy for local ice cream and beers. We have readers who’ve used to BGE with success, so good luck. may have to experiment with the distance from coals, and also direct / indirect. I really love weighing the ingredients because it makes things even faster! What is the weight for 7.5 cups of flour? Our recipes are based on 5oz = 1 cup unbleached all-purpose flour. You can use that to calculate any of our recipes.